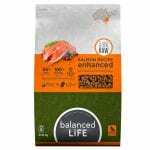 Balanced Life enhanced is Australia’s first grain free dog food with air dried raw meat pieces delivering a delicious, high-protein, complete and balanced diet. Our Salmon Recipe is packed full of premium Australian salmon including real meat pieces and includes superfoods like alfalfa, coconut, cranberries and kelp. Rich in selenium, phosphorous, vitamins B3, B12 and D, and Omega 3 essential fatty acids.